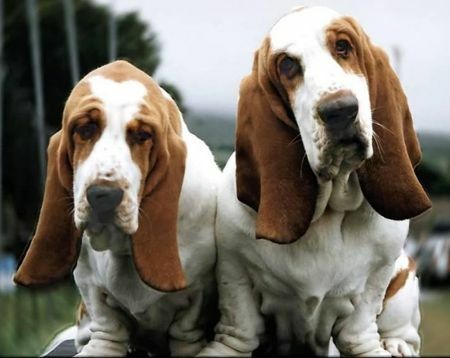 The hounds are the original hunting dogs, many pre-dating the gun-assisting hunters in their sporting group. There is a great deal of diversity, both behavioral and physical, within this group, a history of hunting assistance often being the only common bond among some of the hound breeds. In size, they range from the tall and lanky Irish wolfhound to the short-legged dachshund. A hound by origin only, the dachshund might seem to be out of place in this group, as its background as a digger accustomed to chasing foxes and badgers underground would more logically make it a terrier. For the most part, these breeds originally assisted hunters in the field with either excellent scenting abilities or exceptional speed. Scent hounds such as bloodhounds, beagles and foxhounds have historically aided hunters by following the scent trails left by their quarry. Today the slow, prodding bloodhound is commonly used by law enforcement to track fugitives or missing persons. Some of the oldest breeds of domestic dogs are the speedy sight hounds. Saluki and pharaoh hounds, in particular, can trace their origins back to antiquity. Images of dogs closely resembling these breeds are depicted on the walls of the tombs of the Egyptian pharaohs. Apart from their hunting skills, most hounds make excellent pets. Reliable, sturdy and possessing excellent stamina, they make great companions for adults and children alike. Even the famous racer, the greyhound, has proved to be a popular family pet. Those seeking one out, however, are cautioned when choosing a dog bred for the racetrack. A retired racer should be tested with small children or other pets, as some of these dogs make a habit of chasing them as they have chased mechanical rabbits in their earlier career.